One of my earliest memories is the regal feeling of sitting on top of a hand-cranked freezer as my dad grinded away making home-made ice cream. The anticipation that grew during the long process of mixing and cranking enhanced the enjoyment of the final product, which was much better than the cheap mellorine my mom brought home from the grocery store. 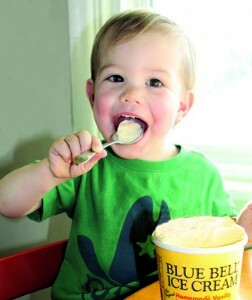 Store-bought ice cream as good as home-made was unknown to me until I discovered Blue Bell sometime in my late teens. Soon afterwards, I spent more than a decade wandering in the ice cream wilderness of Baltimore and Berkeley, pursuing a graduate education and a teaching career. Don’t get me wrong, I ate my share of Breyer’s and Dryer’s without complaint, although regular trips back home to Texas reminded me of what I was missing. When I took a job at Texas A & M in 1981, we finally returned to Texas for good. We celebrated with bowls of Blue Bell, no doubt with background music from Willie Nelson. Life was good. One problem, however, remained. My young daughter was an only child and she had me for a father. To put it mildly, I was deeply involved in her upbringing, and very demanding. When she was one year old, I wondered why she was not talking; at two years, why she could not yet hit a baseball. But as she approached four, I was greatly impressed by her ability to devour ice cream. Indeed, well before her first grade “placement tests,” it was clear to me that she was “gifted and talented” in ice cream. At about the same time, the local Safeway began having regular sales on Blue Bell, with bargains as low as five half gallons for $10. As I read one of these ads, I had a vision of a new way forward, and I proclaimed boldly, “It’s Ice Cream Day.” My daughter immediately understood that whatever this meant, it was going to be good. 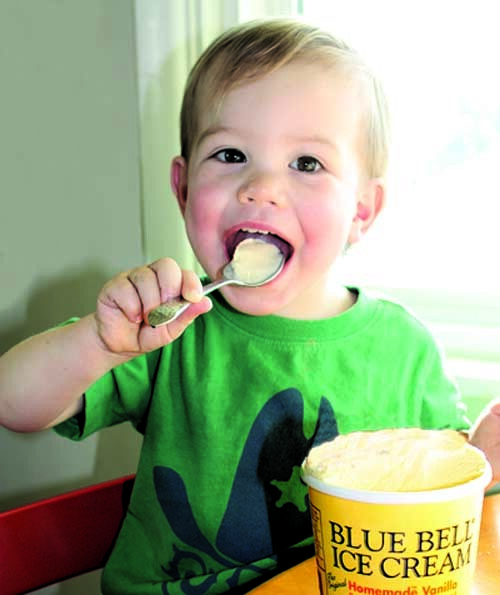 We quickly agreed on basic ground rules: All the Blue Bell you could eat in one day. No limit. As many flavors as you wanted. Without false modesty, I’ll admit that it is the best idea I’ve ever had. We went to the store, and each of us picked out two half gallons of our favorite flavors. We agreed that the fifth “neutral carton” would be Homemade Vanilla, which we both loved with strawberries or chocolate syrup. We then bagged our Blue Bell, drove home, and went to work. On and off for the rest of the day we feasted. My wife did not follow our journey past the first bowl, but she shared our joy and laughed along with us as we listened to old rock and roll music and ate various flavors of ice cream. It quickly became clear that Blue Bell was meant to be savored, not gobbled down like hot dogs at a July Fourth eating contest. No, we did not finish the five half gallons. Indeed, by day’s end, a family tradition has been established, yet plenty of ice cream remained. To avoid overworking our taste buds, we repeated this ritual only once or twice a year. We never got sick; our stomachs knew our limits even if our brains did not. Ice Cream Day did not stop me from being a demanding parent. Along with other similar behavior, it did, however, suggest to my daughter that I was a natural-born goofball playing a very convincing role as an unreasonable dad. In retrospect, I even convinced myself that there was method in my goofiness. From the day my daughter was born, I felt a strong responsibility to be a serious parent who prepared her for adulthood in an often harsh, demanding world. I also believed that a healthy dose of whimsy was good for the soul. Reading this, my daughter, who survived my parenting and grew into an exceptional adult, no doubt will scoff at my effort to cast Ice Cream Day as part of a grand philosophy of child rearing. She will remember it, instead, as a creative excuse for pigging out on ice cream. She now plays the role of a strict mom trying hard to limit her two-year old son’s intake of sweets, including ice cream. Good luck to her on that one, especially with a whimsical grandpa around who recently bought her son his first pint of Blue Bell’s amazing new Orange Swirl and no doubt soon will have a talk with him about family traditions.